For the past year and a half I have been doing a lot of research into the kind of tattoo I wanted. I looked online for inspiration and I created a mini mood board for myself. I wanted my tattoo to have a meaning, I didn't just want to get a tattoo for the sake of getting one or what was in fashion at the current time. At the end of the day a tattoo is for life, it has to be perfect, right? I decided on a mandala design. I was looking at mandalas and lotus flowers because their symbolic meaning meant something to me. A lotus flower grows in a mucky, dirty pond, but still grows into a beautiful flower. This is the same in life. No matter how much bad stuff you go through, it will always have a happy ending. I couldn't decide on a lotus flower design I liked for a tattoo, which is why I then looked at mandalas as they are very similar. We had planned to go to New York on holiday, so I decided that I would get my tattoo done while I was over there to make it more special. If you are going to get a tattoo, you need to go somewhere good. Research the place and pick an artist who's experienced in the type of tattoo you are wanting. I decided to go to the Love Hate Social Club, which is from the TV show NY Ink. I contacted them before hand and they were very helpful. They took lots of detailed information about my tattoo from me and booked me in for my chosen day. They recommended the artist Guy Waisman, as he is good at the mandala designs. I had to pay a $200 deposit to secure my appointment. When I arrived at the tattoo parlour I was greeted by Guy. He measured the area of the tattoo and discussed some possible ideas with me. He then went off to sketch some designs and came back with three different ones for me to choose from. The design was then placed onto the area and moved about and tweaked until it was exactly right. I'd heard from a lot of people that getting a tattoo hurts, especially when its on a bony area. I was getting my tattoo on the top of my foot which is a very bony area, so I was expecting the worse possible pain! 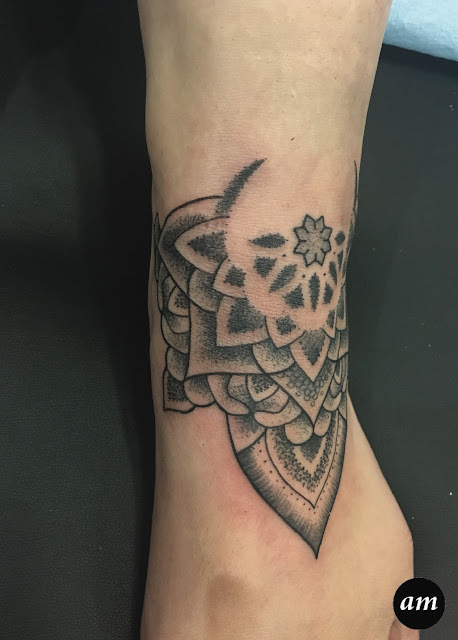 To start off with, Guy tattooed a small line on the design so I could feel what the pain was like. After that he continued tattooing the design, checking that I was ok as he went along. It felt like someone was taking a scalpel and cutting my foot. At first the pain wasn't that bad, I could cope with it. However as time went on, the pain got worse, especially when he went over the same area. 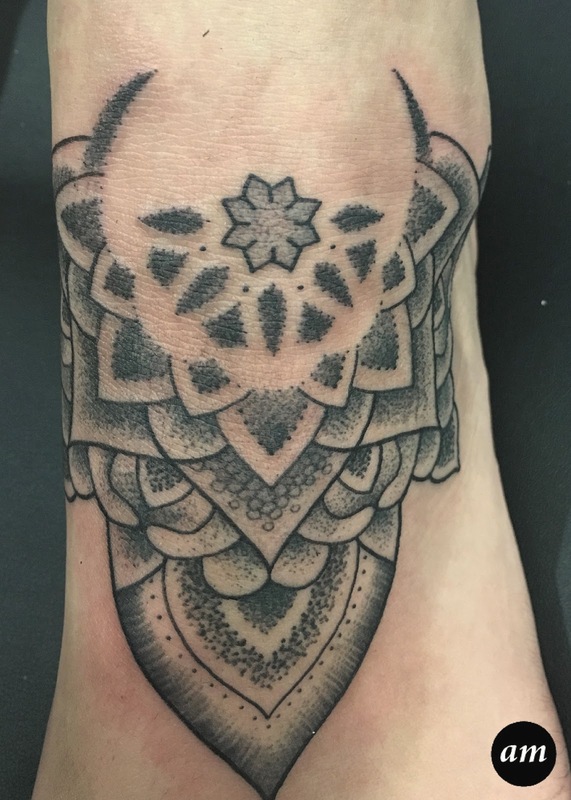 I also felt like a stinging, burning sensation on my foot after he had tattooed an area. 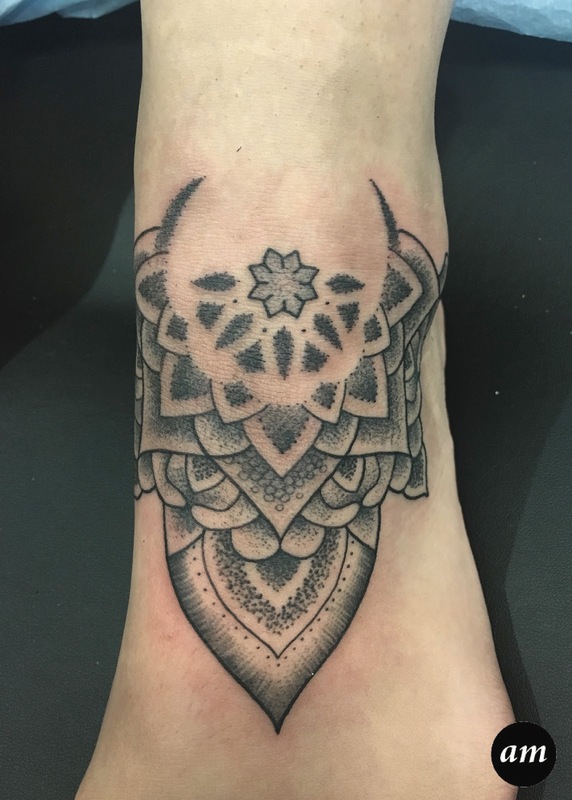 I wasn't going to lie about the pain, if you are reading this post, you are probably thinking of getting a tattoo, therefore I want you to know what to expect! Three hours later it was all over and done with. My foot swelled and hurt when my skin stretched. I bought some cheap flip flops to wear so that my shoes didn't rub the tattoo. I was advised to keep the clingfilm on, that Guy had applied, for two hours. I was also given an aftercare leaflet and advised what products to use on it. For the next few days I rested my foot and slowly, the swelling went down and it stopped hurting. I am very please with the tattoo, it looks amazing! It is so detailed and it is even better than what I imagined it would be. I was made to feel welcome at the Love Hate Social Club and the tattooists were all friendly. All together my tattoo cost $600. It is a lot of money for a tattoo, but it was so worth it. It is a lovely piece of art that is on my body forever. You can click HERE to visit the Love Hate Social Club Website. Click HERE to see Guy Waisman's work on his Instagram page.